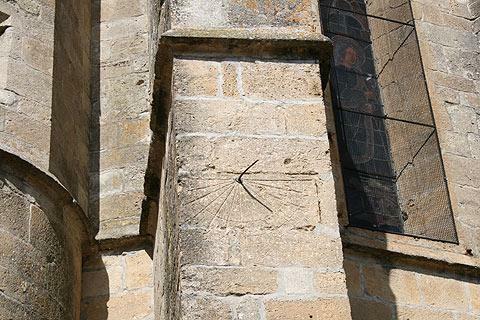 The town of Sauveterre-de-Guyenne is in the Gironde department, north of La Reole and west of Monsegur. It is a bastide town, that still follows very precisely the original 'grid' layout of the original as laid out at the time the town was founded in 1281 - to the extent that you can stand in the centre and look straight out in each direction to see the original four stone gates that were once the entry points into the town. 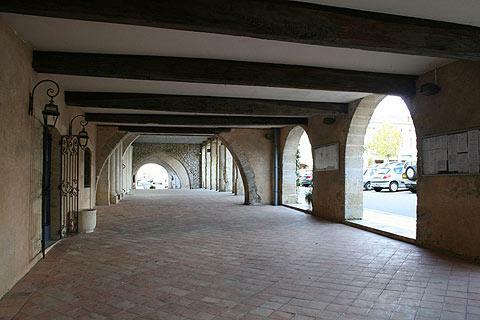 Entering into the heart of Sauveterre-de-Guyenne you will find a large central square, surrounded on all sides by medieval buildings with 14th century arcades below them. Traditionally these arcades provided protection from the weather to the market traders. 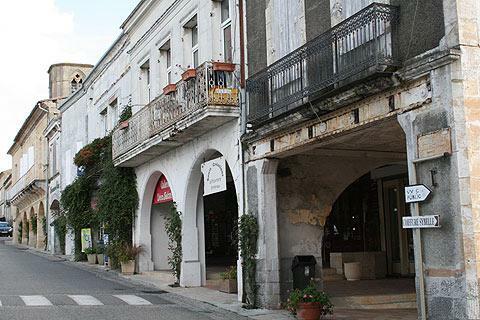 The town has one of the best preserved of the bastide towns centres, and is also perhaps one of the least visited being a little removed from major tourist routes. Under the arcades you will now find a wide selection of shops, cafes and other commerce. France This Way comment: we found that the large size of the main square and the number of cars parked in it, and the smaller number of medieval houses, diminished the impact of Sauveterre-de-Guyenne when compared with the best bastide towns such as Monpazier or Monflanquin...still worth visiting though! 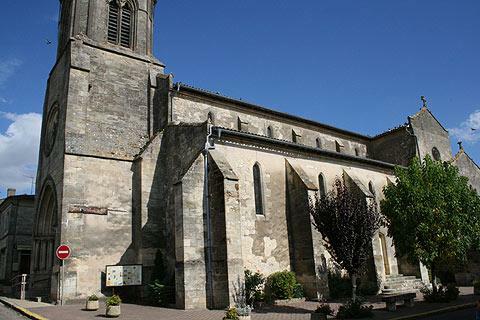 Also dating from the time of the founding of Sauveterre-de-Guyenne is the Church of Notre Dame at the top of the square, although the church was much restored during the 19th century after damage during the Revolution and following a fire. Towards the back of the church (on the outside) you can see a sundial that was built into the walls during the reconstruction. Of the four gateways that once provided access to the town, Porte Saubotte to the west is the most complete. This gate can be visited to see the rooms above the entrance and the views from the terrace on the top. The other gateways are slightly less complete but still make an impressive backdrop to the town. 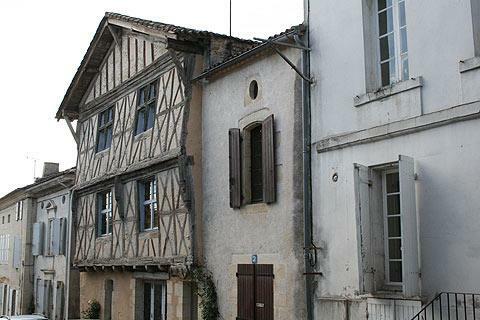 Unlike some of the bastide towns in south-west France you won't find a large number of medieval houses around the centre of Sauveterre-de-Guyenne, but you can see an ancient colombage house on the street just down from the bottom-left of the main square. 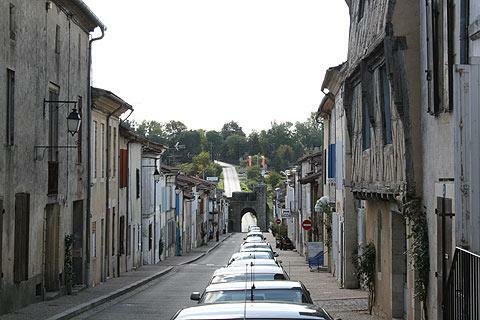 Another town that does not receive the visitor numbers that you would expect can be seen at La Reole, just a few kilometres from Sauveterre-de-Guyenne and with several interesting buildings. Sauveterre-de-Guyenne also represents the eastern part of the Dropt Valley, a quiet part of south-west France that extends east from here to the southern Dordogne region and a pleasant way to discover the area.